We at Time Out are big fans of the mixed grill. We'd go so far as to say there's an art to it, even. Typically, you’re looking at a lamb chop or two, a rasher of bacon, a couple of sausages, a minute steak, and most likely topped with a fried egg. It may or may not surprise you to hear that the Italians have their own version. The dish is called spiedo, and it’s the namesake of Westfield’s new Brescian restaurant. 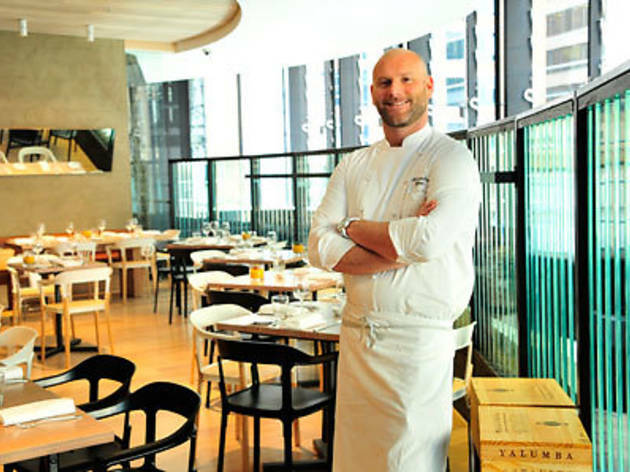 The restaurant is the second for Lombardian chef Alessandro (you can call him Alex) Pavoni. His first place, Ormeggio at the Spit, is a little fancier than Spiedo, which has more of a bistro vibe. There’s nothing cut-price about the menu, though, which features an entire salumi menu including the salame di Pilu - made by Pavoni’s mate, chef Giovanni Pilu, of Pilu at Freshwater fame. It’s served with a little plate of warm black olives. Order the polenta chips from the stuzzichini section while you have a think about what to order. There are deep-fried fontina cheese balls on the stuzzichini menu as well, but order one or the other. Eating both feels like a shortcut to the RPA for a quick hit from their defibrillators. The kitchen’s really on it - flavours are bang on and the food is prepared with incredible care. Poached Murray cod is light, firm and delicate, nesting on a bed of sautéed spinach and topped with a scattering of cannellini beans. We wouldn’t mind going back for the crudo of ocean trout, baby beetroot, dried olives and sheep’s milk yoghurt. Make sure, though, to try the beef battuta. Basically an Italian steak tartare, it’s topped with toasted spelt barley, a few sprigs of watercress, and pungent bagoss cheese – it's a delicious hit of crunch, blood and stink. The spiedo, by the by, is a slow spit roast of layered pork ribs, quail, pork scotch fillet and duck, piled high and served with a fistful of polenta. And try the bigoli - a thick, tubular pasta around the same thickness as bucatini, only made with whole wheat flour and a little duck egg. It’s tossed with fresh green peas, yabbies and green pea puree. Yum. Sure, we’d probably visit Spiedo a lot more if it was, say, somewhere that wasn’t level six of a shopping mall, but the fact it exists at all is pretty cool. Speaking of cool, make sure to try the house-made gelato (see what we did there?) and the tirimisu. A modern take on an Italian classic, the tirimisu is a light-as-all-get-go coffee sponge, chocolate soil, aerated mascarpone and a little coffee granita. It's probably the best in the city. Did we mention Spiedo features its very own grappa menu? Yup, punishing your liver just got slightly easier. Oh, and we’re keen to go back for the Lombardian long lunch - $49 every Sunday for pasta, the roast of the day, salad and dessert. Colour us sold.